Mark Schutter ©2014, 14×16 inch colored pencil drawing (Original completed in 1986). Just for throwback Thursday and Valentines Day, I thought I would post a never before seen drawing I completed in a college drawing class many, many years ago. I also, have words (poetry?) running through my head inspired by this drawing. Stay tuned it may make its way onto paper and posted in time for Valentines Day on Friday! 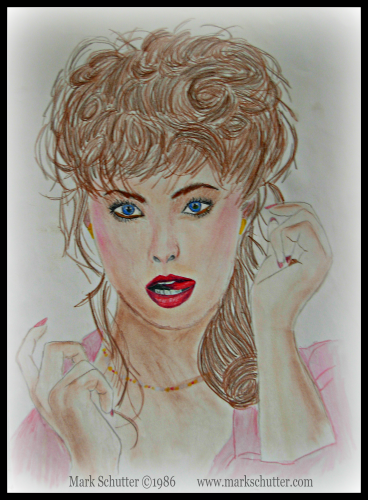 This entry was posted in Art, Life and tagged 2014, Art, College, Colors, drawing, Fun, Girl, Life, memories, Pencils, Throwback Thursday. Bookmark the permalink. Wow! A portrait for the times as well-very ’80’s!